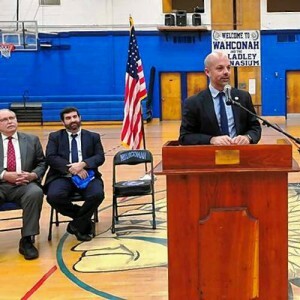 DALTON – State Sen. Adam G. Hinds and state education Commissioner Jeffrey C. Riley announced that 33 rural school districts will receive part of a new $1.5 million appropriation to help cash-strapped rural schools in sparsely populated communities. In Franklin County, the largest aid sums went to Ralph C. Mahar, Mohawk Trail and Pioneer Valley regional school districts. Mahar will receive $183,774; Mohawk will gain $132,932; and Pioneer will be awarded $92,593. Other local school systems to benefit include: Hawlemont ($23,096), New Salem-Wendell ($21,657), Rowe ($3,913), Orange ($51,458), Sunderland ($4,840) and Erving ($4,153). The largest award, of $246,056, went to the Central Berkshire Regional School District, which serves seven towns in Berkshire and Hampshire county towns. “Rural school districts face the same fixed costs as school districts throughout Massachusetts, but these costs become more difficult to manage with a declining population and the need to regionalize over large geographic areas,” said state Rep. Paul W. Mark, who also worked to establish the aid program. “Rural School Aid is intended to help level the playing field for these school districts where need is great and resources are scarce,” he said. School districts that qualify for Rural School Aid have fewer than 21 students per square mile in communities where the average per-capita income is not greater than the statewide income average. School districts with less than 11 students per square mile and incomes of no more than the state average per capita income qualify for the largest amount of aid.